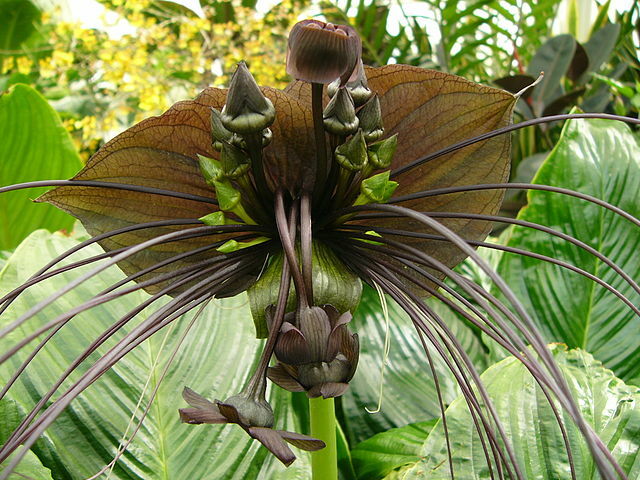 Tacca chantrieri has a purple-black, curious yet magnificent inflorescence with wide-spread wings and whisker-like bracts hanging from the side. The inflorescence of this tropical plant almost looks like a bat or jungle cat in the wild. Thus giving the plant a common name of the Black Bat Flower. Tacca chantrieri – Wikimedia Commons: photograph by Jef Poskanzer, distributed under a CC-BY 2.0 license. Since this is dependent on the classification system being used, it is important to first understand that Tacca comes from the order Dioscoreales. With different systems in use to classify different species the families to which they belong may differ. In the Dahlgren system of 1985, the order Dioscoreales comprised of seven families, two of which were Tacccaceae and Dioscoreaceae. These families were linked mainly due to features “indicating connections with dicotyledons.” (Caddick et al., 2002). However recent analyses of morphological and molecular data has caused reconsideration of the order Dioscoreales. In the first Angiosperm Phylogeny Group (APG) classification system, published in 1998, the order Dioscoreales, also known as the yam order, contained five families. These were: Dioscoreaceae, Burmannianaceae, Thismiaceae, Tricopodaceae and Taccaceae. However, in 2003, in the revised APG II system, Taccaceae and Thismiaceae were included in the family Dioscoreaceae. Tricopodaceae was placed into Burmannianaceae and a new family Nartheciaceae added to the order [Encylopaedia Britannica]. These changes were made on the basis of morphological similarities such as tuberous roots, reticulate (net) – veined leaves and reflexed stamens (Zhang et al., 2011). The genus Tacca comprises of about 15 species, all of which are tropical plants, mainly Paleotropical in distribution. 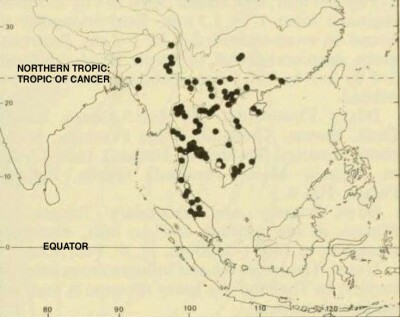 The majority of the species are found around Southeast Asia, 13 of which are restricted to Indo-Malesia. A few species are also found in South America and Africa (Zhang et al., 2011). Specifically, Tacca chantrieri is native to Malayasia (Everett, T. H., 1982). Tacca cristata – Relative of T. chantrieri, in the same family of Dioscoreaceae. Tacca chantrieri is an evergreen tropical jungle plant which lives in the forest understory, which explains the reason why locals could mistake it for a jungle cat or bat due to its distinctive features. It likes shaded areas where its large leaves remain protected from the wind, rain and any falling debris. The plant requires plenty of moisture in humus-rich and well-drained soils. As for my morphology… Tacca chantrieri is a popular species and most commonly known for its uniquely strange inflorescence shape and colour. This monocotyledon has long stalked, broad leaves of an olive- (dark) green colour growing up to 70cm wide (Everett, T. H., 1982). The most eye-catching feature of the plant is its dramatic inflorescence. Its dark purple, maroon or black inflorescence can grow up to 50cm wide, sometimes made up of 25 flowers. The inflorescence has two pairs of large spread, wing-like bracts with thread-like whiskers growing beneath them, known as bracteoles. The inflorescence also has smaller black flowers with 5 petals which hang like berries, giving it a bat shaped appearance. The root of this plant is long and tuberous similar to its relative Tacca leontopetaloides, also known as Polynesian Arrowroot. Tacca chatrieri – Wikimedia Commons: photograph by Jef Poskanzer, distributed under a CC-BY 2.0 license. To make that botanically clear…. T. chantriei flowers are actinomorphic with a cymose umbellate inflorescence subtended by purple bracts with whisker-like bracteoles drooping by the side. The flower is hermaphroditic with 6 stamens and a pistil (Zhang et al., 2004). 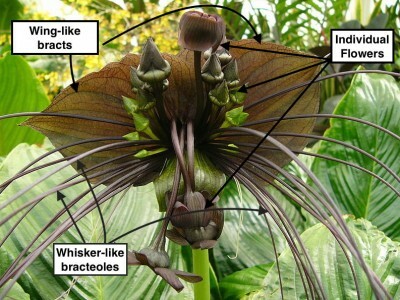 This explains the reason behind the vernacular names of the ‘black bat flower’, ‘devil flower’ and ‘tigers whiskers’. Why I might look like this? Studies suggest the reason for the flowers unique features is for pollination purposes. Drenth (1972) and Saw (1993) believed that the flower was trying to resemble rotting organic material through its smell and colour in order to attract flies for cross-pollination. This is known as the sapromyiophilous syndrome (Zhang, L., et al., 2004). On the contrary Zhang et al., (2011) concluded that T. chantrieri is a self-pollinating plant which has undergone considerable change throughout its evolutionary history causing it to no longer use the inflorescence as an attraction for potential pollinators such as flies. 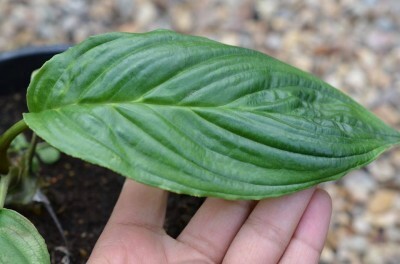 A suggested reason for its unique inflorescence structure may be to assist in photosynthesis in the shady understory as well as to protect the plant from being eaten by herbivores. Cultivation For the gardeners, T. chantrieri grows well in pots, by maintaining regular pruning and removal of dead leaves and flowers the plant should grow beautifully (Clay & Hubbard, 1987). 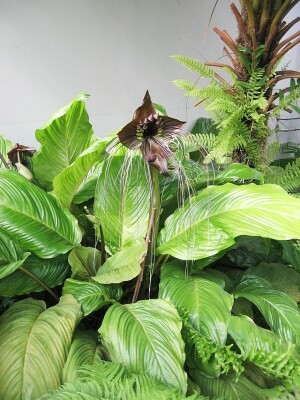 Various species of Tacca are popularly cultivated as ornamental plants including the White Bat Flower, Tacca integrifolia. T. chantrieri has played a role in Chinese traditional medicine as a herbal remedy for various health-related problems. It has been said that the plant has good anti-inflammatory properties due to its steroidal components in its tuberous roots making it good for treating burns, gastric ulcers, stomach-aches and incised wounds (Huang et al., 2003). In addition, it has been used for treatment of hypertension, as research showing its extracts contain cardiovascular attributes such as vaso-relaxants (Williams, C., 2012). Caddick, L. R., Wilkin, P., Rudall, P. J., Hedderson, T, A J. and Chase, M. W. (2002). Yams Reclassified: A Recircumsciption of Dioscoreaceae and Dioscoreales. Taxon. Vol. 51. No. 1. pp. 103-114. Clay, H. F. and Hubbard, J. C. (1987). Tropical Exotics. University of Hawaii Press. pp. 139. Drenth, E. (1972). A revision of the family Taccaceae. Blumea. Vol. 20: 367-406. Encylopedia Britannica, 2014. Dioscoreales. [online] Available at: <http://www.britannica.com/EBchecked/topic/164410/Dioscoreales> Accessed: 03 Nov 2014. Everett, T. H. (1982). The New York Botanical Garden Illustrated Encyclopedia of Horticulture. New York: Garland Publishing, Inc.
Huang, Y., Muehlbauer, A., Henkel, T. and Liu, J. K. (2003). Two New Taccalonolides from Tropical Plant Tacca Subfleallata. Chinese Chemical Letters. Vol. 14. No. 1. pp. 68-71. Saw, L. G. (1993). Tacca: flowering and fruiting behaviour. Nature Malaysiana Vol. 18: 3-6. Williams, C. (2012). Medicinal Plants in Australia Volume 3: Plants, potions and poison. Australia: Rosenberg Publishing Pry Ltd.
Zhang, L., et al. (2004) Predicting mating patterns from pollination syndromes: the case of “sapromyiophily” in Tacca chantrieri (Taccaceae). American Journal for Botany. Vol. 92. No. 2. pp. 517-524. [Accessed 13 Oct 2014]. Zhang, L., Li, H., Gao, L., Yang, J., Li, D., Cannon, C. H., Chen, J. and Li, Q. (2011). Phylogeny and Evolution of Bracts and Bracteoles in Tacca (Dioscoeaceae). Journal of Integrative Plant Biology. Vol. 53. No. 11. pp. 901-911. 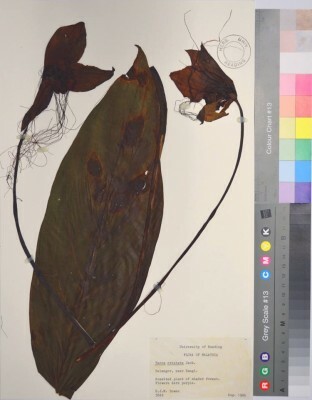 This entry was posted in Asia, Countries, Monocots, Species, Students and tagged Asia, Bat flower, exotic plants, MSc Plant Diversity, ornamental plant, Tacca, Tacca chantrieri, Toral Shah, Tropical biodiversity. Bookmark the permalink. 2 Responses to Tacca chantrieri – Halloween in the plant world!